Here is the full leaked press release of the upcoming Samyang AF 24mm f/2.8 FE lens, which will be officially announced tomorrow (June 11th). Samyang AF 24mm f/2.8 FE is designed specifically for Sony’s mirrorless system cameras and is compatible with full-frame sensors. But it can also be used with models of the A6xxx series that are equipped with the smaller APS-C sensor. 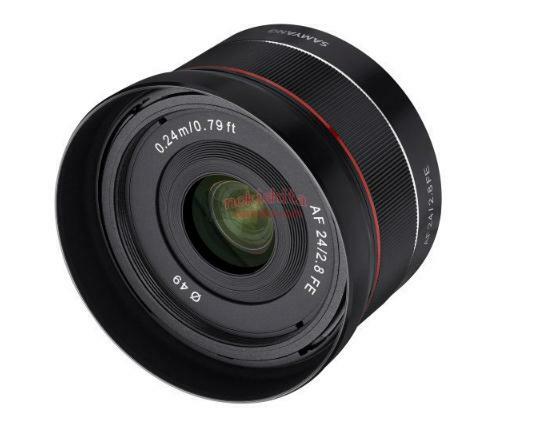 Samyang AF 24mm f/2.8 FE is a perfect wide-angle lens for Sony photographers who want to keep their photo equipment as small and lightweight as possible without sacrificing functionality or optical quality. The lens weighs only 93 grams and can be used for a vast range of subjects, from landscape, travel and architecture to street photography, group shots, and even sports! The lens has fast, silent and accurate autofocus, and thanks to a minimum focus of only 24 cm, it’s possible to get close to the subject and at the same include a part of the surrounding environment in the picture. A great feature when you want to capture cool detail photos on your holiday trip! Despite its small and lightweight format, Samyang AF 24mm f/2.8 FE contains 7 lens elements, divided into 7 groups. To minimize optical aberrations and ensure maximum sharpness all the way to the edges, the construction includes three aspherical lens elements and two made of HR (High Refractive) glass. Samyang’s advanced Ultra Multi Coating ensures that the images show high contrast and brilliance as well as neutral color reproduction even in difficult lighting conditions. Compact and super light – only 93 grams!